It’s a shame that wedding dresses can be only worn on one’s wedding day. 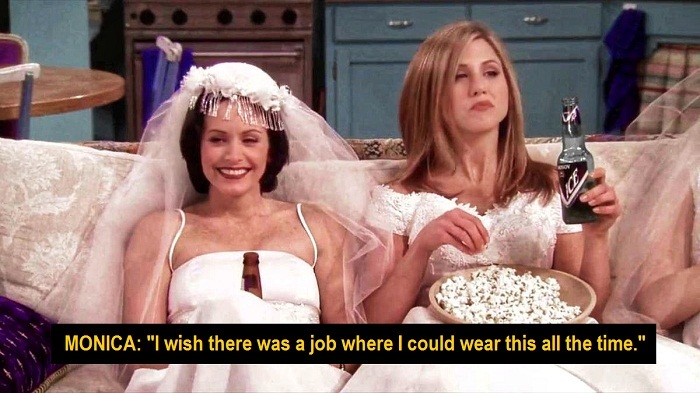 Remember that episode in F.R.I.E.N.D.S when Monica wanted a job where she could wear her wedding dress every day? Well, that’s most of us! However, this bride couldn’t stand her wedding gown being trapped in the wardrobe, so she took it out for a spin to 33 different countries in the world! Nick and Zoe Aust, known as @marrymeintravel on Instagram, got hitched in December 2017. They quit their regular 9-5 jobs and started their picture perfect adventure together. “Life is too short to only wear your wedding dress once. And the world is too big to only stay in your little town your whole life. Our hope is that when people see our pictures they feel nothing but inspired to explore a new place, try a new hobby and fulfill that dream they’ve always had”, said the couple. According to sources, Nick and Zoe came up with the idea of Marry Me In Travel on their very first date! “We hinted at traveling the world together one day”, said the couple. From Sri Lanka to Paris, the world became a canvas for Nick and Joe in 2018. The two would take breathtaking pictures in each of the stunning locations. “Zoe chose the Ferrera gown which ended up being the prefect dress for her travels. It was inspired by the spirit of a fun-loving bride with distinct taste,” said Watters Dunbar, Director of Watters’ Style from where Zoe bought the gown. “I try on the dress and my mom and dad are speechless, I’m speechless. I feel like a bride. I can hear Nick over and over again saying ‘You can do anything, be anyone, wear what you want to wear,’” Zoe says. Nick and Joe always had travel plans going on in their minds. But they never knew thought that they would take the dress along! “This dress has seen trains, boats, flights, Tuk Tuk rides, taxis and a helicopter ride over Mount Everest. It’s seen snow and incredible heat, rain and fog. It’s been covered in dirt and washed in the Indian Ocean” – Zoe. Zoe swam in the ocean, climbed the Great Wall of China, rode a bicycle in Japan, and did a ton of other crazy stuff wearing that dress. “But my greatest accomplishment while wearing it was marrying Nick. I’m so incredibly thankful for all this dress has withstood, but that will always be my favorite memory in it,” said Zoe. They have visited India too! Here are some more pictures to soothe your eyes! Guess wedding dresses are not just for one day after all!